In addition to delivering first-class residential garage door services, Lux Overhead specializes in installing, repairing, and maintaining commercial overhead doors for a variety of businesses and industries in Saskatoon and across Saskatchewan. Overhead doors have a wide range of commercial and industrial applications from police stations, firehouses, hospitals, and government facilities to warehouses, shipping companies, repair shops, and car washes. 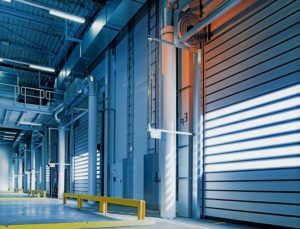 If you are in the market for an overhead door, it is important to learn as much as possible about the different types before deciding on the right one for your business. Commercial overhead doors are available in two main types – sectional and rolling, also known as roll-up. Each kind operates differently and has styles that offer distinct advantages, so choosing the right commercial overhead door will really depend on the needs of your business. Much like residential garage doors, sectional commercial overhead doors operate along a track. When the door is opened, it rises vertically until its sections are resting horizontally in the track, usually mounted on the ceiling. Generally, sectional doors designed for commercial or industrial use are constructed from aluminum or light steel. Therefore, sectional doors do not offer the same security and protection provided by rolling doors. However, these doors allow for more creativity and versatility when it comes to style and other functional benefits. There are a few different kinds of sectional doors that may be just what you are looking for. Wind Load Rated: Although sectional doors may not usually be as strong as their roll-up counterparts, doors that have been wind load rated are guaranteed to protect against external pressure from the wind and negative forces, like suction. Thermal: In many industrial settings, keeping the temperature at a consistent level inside the building is of vital importance. Thickly padded and insulated thermal doors help to regulate the indoor temperature, whether you are fighting harsh weather conditions or protecting particular areas or products that cannot handle a fluctuating atmosphere. Aluminum Glass: For a more visually pleasing option, aluminum glass overhead doors can add to the overall aesthetics of your commercial business. The glass windows allow plenty of natural light and complete visual access, and the doors can be customized to complement the design of your building. If safety and security are paramount in your industry, rolling – or roll-up – commercial overhead doors are the recommended option and have grown in popularity among businesses over the last several years. 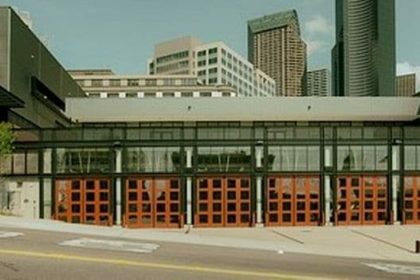 Typically made of stainless steel, galvanized steel, or heavy aluminum, these doors are stronger, longer-lasting, and more durable, offering superior security and protection against fire damage and other hazards. As its name implies, the rolling door is rolled up via motor control and rests in a coil when it is open, saving space without the need for a track mounted on the ceiling like the sectional overhead doors require. These doors are available in different styles and configurations that can suit the needs of your business. Fire Rated: To adhere to safety standards and regulations, your business may require a fire rated rolling door. In addition to providing the dependable protection and security of an ordinary steel roll-up door, the fire rated door ups the ante and shields your facility from dangerous fire damage. Wind Load Rated: Fire is not the only hazard that can negatively impact your place of business. Without a wind load rated door, extreme weather conditions outside can wreak havoc and subject your facility to external wind pressure and negative suction force. Like their sectional counterparts, rolling wind load rated commercial doors are built to withstand mighty forces. Security Grilles: An easily recognizable type of rolling door, the security grille can be operated manually by hand or remotely with a motor and control. These unique doors are ideal for protecting interior and exterior openings in stores, shops, and restaurants inside and outside the mall, plus other public access areas such as banks, pharmacies, stadiums, and airports. High Speed: As opposed to the physical security offered by the solid steel doors, high speed rolling doors are available in rubber or fabric and focus on a different kind of protection. These doors open and close very quickly, yet safely. They are often found in refrigerated facilities to regulate temperature, as well as clean rooms where any contaminants that are allowed inside could spell disaster. 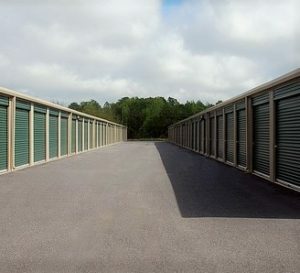 In these cases especially, a high-speed commercial rolling door is necessary. To ensure that your business enjoys total perimeter security, we also sell, install, and maintain both sliding and swinging gate systems for commercial and industrial properties. With these sturdy and reliable gate systems, you will have full control over who gains access to your property. Conveniently operated by a motorized system, these imposing gates are available in both swinging and sliding variations and protect your business from potential intruder saving you the time, money, and emotional turmoil that is usually spent in dealing with theft and damage from vandalism. Commercial and industrial gate systems come in a number of styles and configurations that allow for ease of use, accessibility, and functionality while still standing as a strong symbol of your investment in safety and security. Since these gates are virtually impregnable, most would-be criminals do not even bother trying to break in. When your business is protected by secure gate systems, rest assured that the only people on your property will be those who are supposed to be there. Now that you are more familiar with the different types of commercial and industrial overhead doors, you might have an idea of the right door for your business. Whether you have something in mind or you are still on the fence, our qualified experts would be glad to visit your facility and make recommendations based on your needs, including customization options. At Lux Overhead, we can open the door to your future.